Territorial Creative Arts Ensemble ministers in California prison. Would a group of “hardened” prisoners open up to the creative process, becoming vulnerable and sharing their feelings? The Salvation Army Western Territorial Creative Arts Ensemble (TCAE), led by Jessica Fagerstrom, Territorial Creative Arts Director, made this their mission. A group of men incarcerated at the California Rehabilitation Center in Norco experienced prison in a new way when the TCAE led them in a late September weekend workshop. In fact, by Saturday night, many of them were able to envision a victorious future with Jesus in charge of their lives. The men surprised team member Vernon Luong. Team members’ own reactions were a surprise as they got to know the men. The TCAE team participated with the inmates as they told their stories—past, present and future—through drama, movement and creative writing. In a dramatic final victory scene, men boarded a bus bound for the “City of Champions,” steered by TCAE member Lt. Colonel Tim Foley portraying Jesus. An inmate reads the letter he wrote to his future self while fellow inmates dramatize it through creative movement. TCAE members felt the Holy Spirit at work. 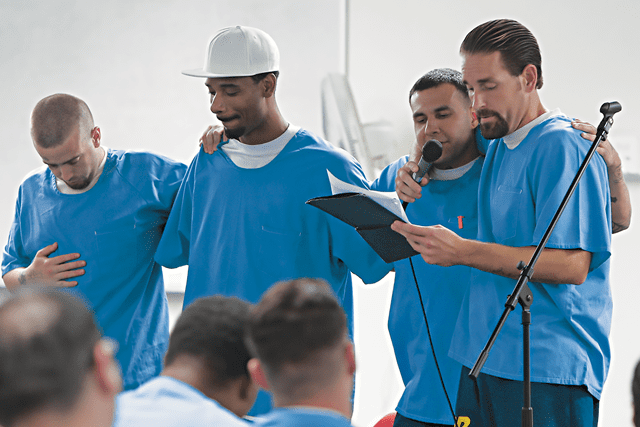 Some TCAE members took part in a similar one-day ministry at the prison in April that likewise allowed the men to tell their stories through the arts. Word spread about the ministry—it was both fun and powerful—and about twice as many men showed up for the recent two-day experience. The additional time allowed for more detail and depth in the creative process. In addition, a media team from Western Territorial Headquarters accompanied the TCAE, filming highlights from the weekend and interviews with inmates and TCAE members. They will create several videos to be used throughout the territory—and possibly beyond—in Salvation Army ministry. The film crew also videoed the inmates and TCAE as they sang “Soon and Very Soon,” “O Freedom” and “Amazing Grace,” with the men adding their own additional lyrics to the first two songs. The weekend concluded with a Saturday night performance to a full house. Ultimately, the TCAE is not just about performing; it is first and foremost an outreach ministry group. The 2017 TCAE includes Jessica Fagerstrom, Hannah Bridgeo, Stephanie Bridgeo, Xiomara Craig, David Fenrich, Tim Foley, Karen Gleason, Kat Henwood, Vernon Luong, Anna Marino, Katelin McPhee and Arrianna Tate.